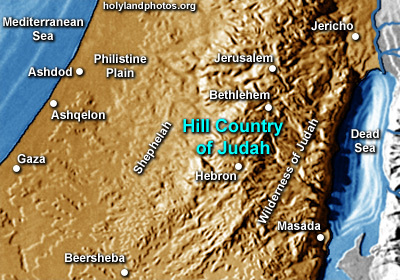 The Hill Country of Judah is one of the “heartland” regions of ancient Israel. It basically stretches 40 mi. [64 km] from Jerusalem in the north, south to the area just north of Beersheba. The hills in this region range from 2,500 to 3,000 ft. [760 to 920 m.] above sea level. It is composed primarily of harder Cenomanian limestone that has weathered in such a way so as to form deep “v-shaped” valleys that typically have terraced sides. Because of these the character of these valleys, this region is difficult to get into and out of – and thus has its natural protection. The chief cities of this area are Hebron to the south and Jerusalem in the north. For a more comprehensive description of this area Click Here for purchase. See Carl Rasmussen, The Zondervan NIV Atlas of the Bible (Grand Rapids, MI: Zondervan, 1989), [atlas], p. 42.